There is a boatload of differences between cats and dogs, and this is never more apparent than when you feed them human food. It’s safe to assume that the dog will jump right in with no regard to their personal health or safety. If they could eat an entire loaf of bread in one sitting, they would. Cats, on the other hand, are much more picky, turning up their noses at almost anything that’s not made of delicious meat. Did you know that cats have little to no interest in sugary foods? Sure, one could wonder how any living creature could possibly resist the succulent sweet flavor of chocolate, but as it turns out, cats aren’t even capable of tasting sweetness. Indeed, a study done in 2005 took an exhaustive look at feline taste receptors, and the conclusion is that cats lack the receptors that are necessary to taste sweet things. It’s impossible for us to know exactly what a cat tastes when they eat sweet things, but one thing that we know for sure is that it’s a whole lot different from what we experience. Unlike dogs, who have no problem chasing after the yummiest treats, cats tend to prioritize food that is healthy for them. But, how do they know what’s good for them and what’s not? Another cat taste receptor study, conducted as recently as 2015, confirms that cats have extremely sensitive receptors in regards to bitterness and that they’re exceptionally good at identifying this before they even take a bite. This most likely has to do with scent — even in humans, scent and taste are closely linked. It seems as if cats have an almost supernatural ability to detect food that will give them no nutritional value. One thing to know about your cats is that they’re creatures of routine. Cats don’t like surprises or new things, and when they find a groove they’re comfortable with, it’s stressful for them when it’s disrupted. For that reason, a lot of cats are loathe to try new foods, even if it would be a boon to their health. That’s why your kitty may turn up their nose at the new cat food you bought; they’re used to the old stuff and have no interest in changing their ways. The best way around this is to slowly acclimate them to something new by gradually mixing it into their current food, increasing the dosage over time until it’s completely replaced. 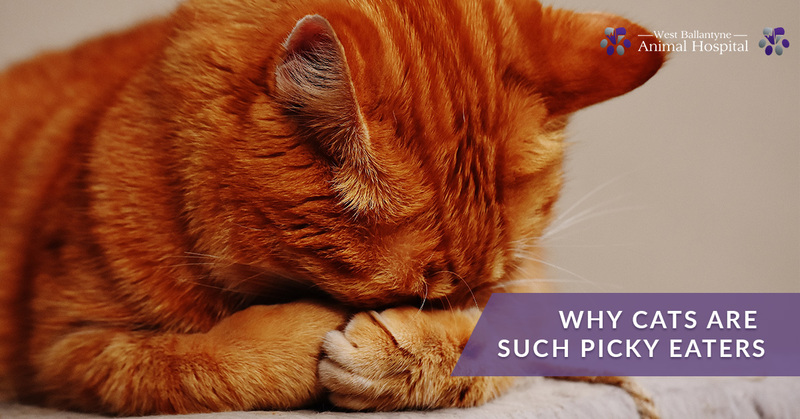 The last thing you should know is that you should visit your local animal clinic if you have any concerns about your cat’s health or dietary habits. Cats have very capable bodies that require quality nutrition and diet. If they’re not getting this, it can spell out more serious problems in the future. Contact West Ballantyne Animal Hospital today if you’re in the Charlotte area and want to take your cat in for a vet checkup!